Columbia Harley-Davidson is accepting applications & resumes for a full time position as a Parts Department Consultant. You must have basic retail experience, computer skills, friendly personality, and willingness to work with a group. Hours: Tuesday-Friday 10am-6pm & Saturday 9am -5pm. 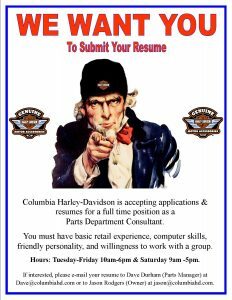 If interested, please e-mail your resume to Dave Durham (Parts Manager) at Dave@columbiahd.com or to Jason Rodgers (Owner) at jason@columbiahd.com.